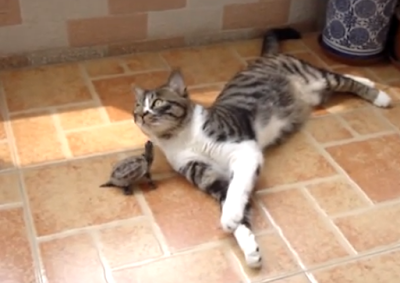 I recently stumbled upon this very adorable video of a turtle who totally loves this certain cat. The cat, however, was trying his best to ignore the turtle. The turtle kept running towards him, and never stopped to do so, even though the cat was trying to avoid and push the other one away by the end of the video. That is one determined turtle. Despite their differences, he did not stop. Way to go, Mr. Turtle!